Want to visit this hot location? Select "Want Name/Address"
WESTLAKE VILLAGE: Are you looking to get into Westlake Village with your pizza/Italian cafe concept, then you have to take a look at this quaint restaurant located in a very high traffic area boutique center. This center has several local favorite restaurants and cafes and is located in the heart of Westlake Village with plenty of parking and easy access. 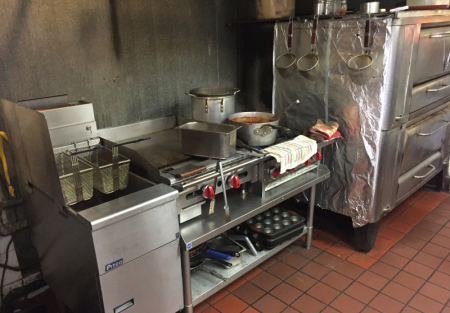 THE KITCHEN: The kitchen, which has a number of new pieces of equipment, has all you need to prepare not only pizza, but full course meals including a flat iron griddle, two deep fryers, and a four burner stove, plus a double-decker pizza oven. There are plenty of prep tables for salad and sandwiches as well. There is a type 1 and type 2 hood system. There is no grease trap. THE RESTAURANT: This restaurant has 1,000 Sq. Ft. space and seats 34 patrons plus 4 on the patio. This is a perfect fine dining space as well. The broker understands a space next door for 1,000 could become available in the near future so you can expand. Buyer needs to verify this fact with landlord. THE NUMBERS: In 2016, the sales were $242,000 for this small family restaurant with a profit of about $54,000. Seller claims monthly sales are about $25,000 to $26,000 and steadily growing. Buyer needs to verify and not reply on this statement. In late 2017, the owner transferred the business to a relative, who spent a substantial amount replacing equipment with new equipment in addition to replacing the HVAC system. The relative (current owner) is a medical professional and has an opportunity to move to Las Vegas area for a lucrative position.